It’s hard to believe these truffles contain no refined sugar or dairy, but are packed with goodness and count as two of your five a day thanks to the addition of beetroot and avocado. 1 Put the beetroot, avocado, vanilla extract, maple syrup and half of the cacao powder into a blender or food processor. Process until well combined. 2 Add the remaining cacao powder to the blender and again process until well combined. Transfer the chocolate mixture to a small bowl. Cover and refrigerate for at least an hour. 3 Once chilled, scoop tablespoon-sized portions of the mixture and roll in your palms to form balls – the mixture will be slightly sticky but should form balls easily. 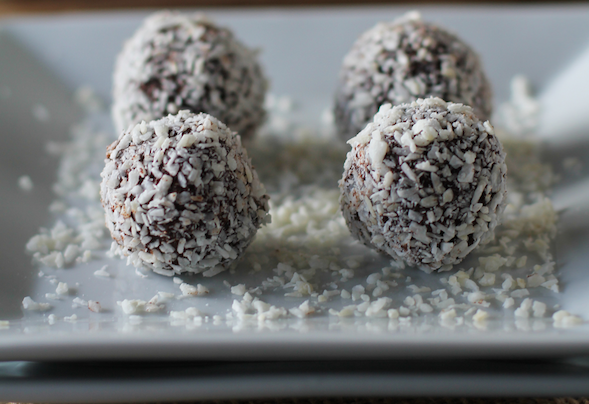 4 Put some extra cacao powder and desiccated coconut in a plate and roll the chocolate truffles around in one or the other to coat.